Description: The USS Texas is a very rare battleship. She is the only surviving ship that served in both World War I and World War II. She is also the only Dreadnought style battleship that has been preserved. When she was commissioned in 1914 she was the most advanced weapon in the world. Now she serves as a reminder of the technology and the people who used it to help defend our country. Location: 3523 Independence Parkway South LaPorte Texas. LaPorte is east of Houston. Cost: $12 per person per day. Children 6 and under are free. Tours of the ship are included in the Texas State Park Annual Pass. Operating Seasons and Hours: Open daily from 10:00 am to 5:00 pm. Closed on Thanksgiving, Christmas Eve and Christmas Day. This was the second stop of the seventh day of the Texas Coastline Road Trip that my husband and I took our kids on in November of 2014. We'd driven across the Fred Hartman Bridge on Highway 146 from Baytown into LaPorte. 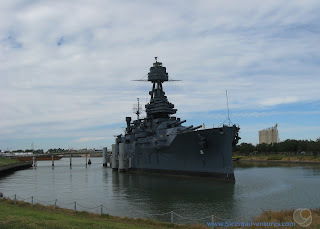 Then we drove 12 miles north to reach Battleship Texas State Historic Site. When I was a teenager I read a book called Navy and Empire by James L Stokesbury. The book is all about the British Navy during over 400 years of it's history. I found the book fascinating. I came away from the book with a love and respect for ships. The ship that I found the most interesting was the Dreadnought style of battleship. These armored and well gunned ships were revolutionary when they were developed in 1905. Great Britain was the first to start equipping it's navy with these massive ships, but within ten years every large navy had Dreadnought style battleships. These ships would be crucial in World War I and play important roles in World War II as well. 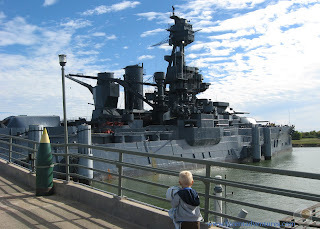 So when I read that the not only was there a battleship on display near Houston Texas, but that it was a Dreadnought - well I just had to see it. Had too. 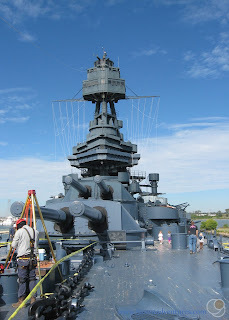 Before we went to see the USS Texas I did a little bit of reading about the battleship. The USS Texas is the only surviving ship that served in both World War I and World War II. When the USS Texas was commissioned in 1914 she was the most advanced weapon in the world. 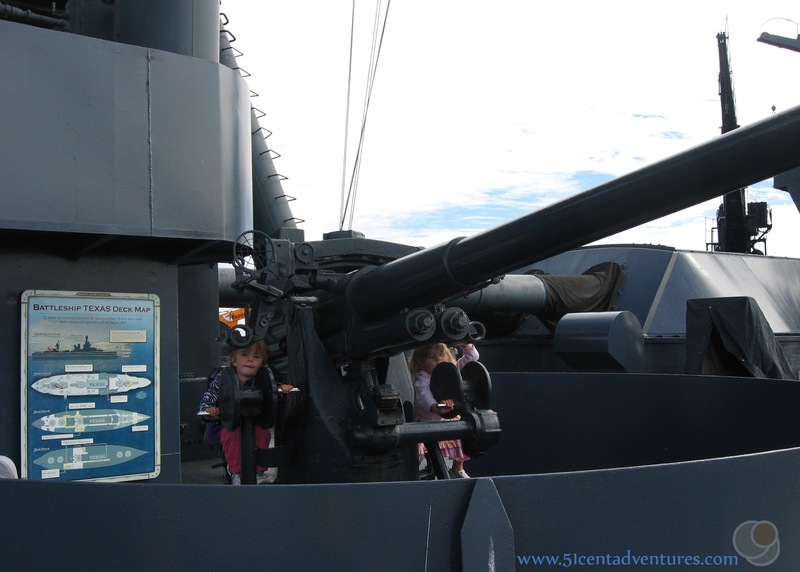 In 1916 she was the first ship outfitted with anti-aircraft guns. After World War I she was upgraded to run on fuel oil instead of coal. She was also equipped with radar. During World War II she participated in D-Day. And then later moved to duty in the Pacific ocean. 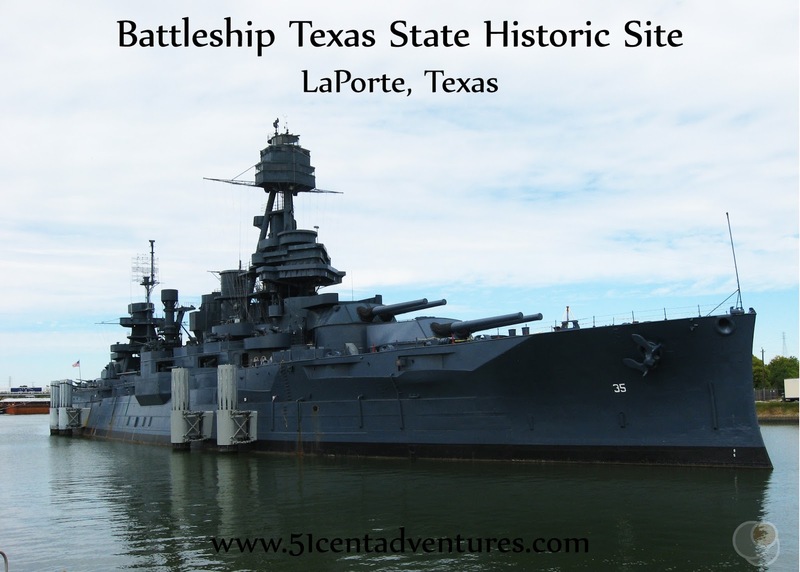 In 1948 she was decommissioned and sold to the State of Texas where she became a memorial. Tickets for a tour of the ship are $12 for adults, which is a little high for my family. Fortunately, the price of the tour was covered by the Texas State Parks Annual Pass that we'd bought at the beginning of our trip. Still I might have paid for the tour anyway - this was the only surviving Dreadnought style battleship in the world after all. We checked in with the park office and then were allowed to access the bridge that led from the land onto the ship. I was surprised that we were allowed to go on a self guided tour of the ship. I'd imagined that we'd have to go on a group tour. 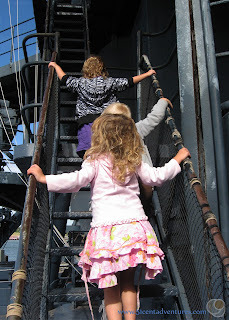 Group tours can be tricky with four little kids so I was happy that we were able to explore the ship at our own pace. (Which means quickly.) My children had fun walking around the different decks and touching the machinery. 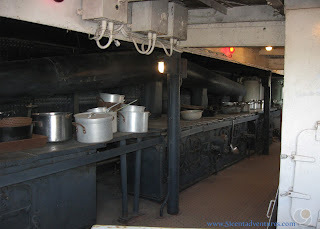 Without a tour guide showing us around we could pretend we were crew members on the ship. My twins were especially excited about all the big guns on the ship. 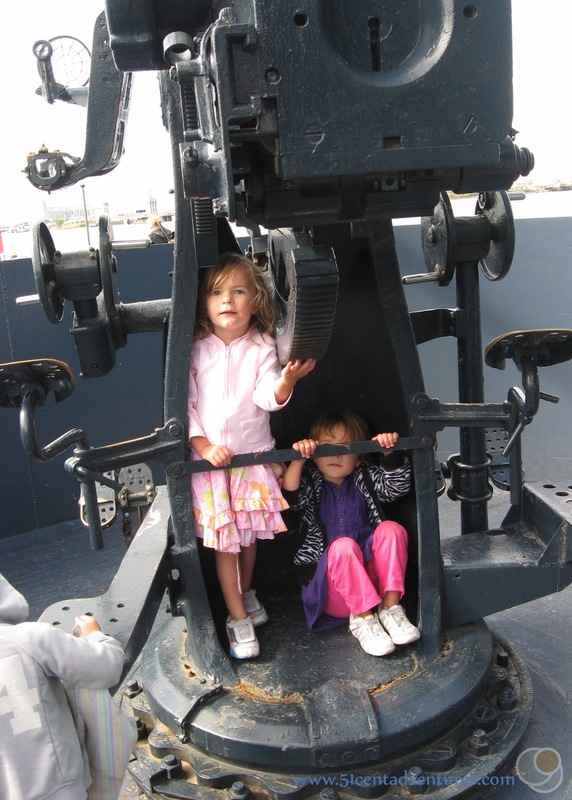 The twins sat at the guns and yelled things like, "I just shot a tree," or "I shot a boat." Here they are posing with their gun. Like I said, we were able to walk pretty much all over the ship. There were many staircases that kept taking us higher and higher. Going up the stairs was easy, but going back down was a little tricky. I kept worrying that one of the kids would trip and fall down the stairs. My legs hurt for two days after carrying my heavy two year old son down the stairs. We couldn't go to the very top of the ship, but we did get pretty high. The view was great. 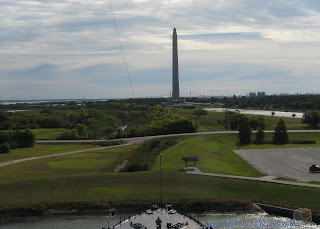 We could see the San Jacinto Monument with the Baytown Bridge in the back ground. This is the bow of the ship. Check out those large guns on the front. There were some workers doing some structural improvements to the ship, but they didn't mind us walking nearby. 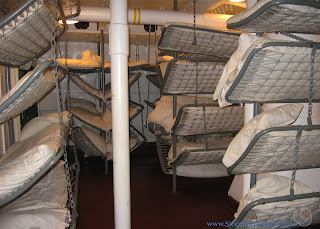 As if all the outside stuff hadn't been interesting enough we were also allowed to explore the inside of the ship. There were lots of information placards the described the different rooms. This was one of the many sleeping quarters. I can't imagine trying to sleep in a room this crowded. Life on the bottom bunk must have been miserable. We stayed on the ship for over an hour which was kind of a record for us. It seemed like every time we thought we'd seen everything we'd discover another deck or another gun. I was still in awe that we were able to see so much of the ship. Eventually the kids started losing interest, and so it was time to go. Visiting this ship had been one of the highlights of our seven day roadtrip. 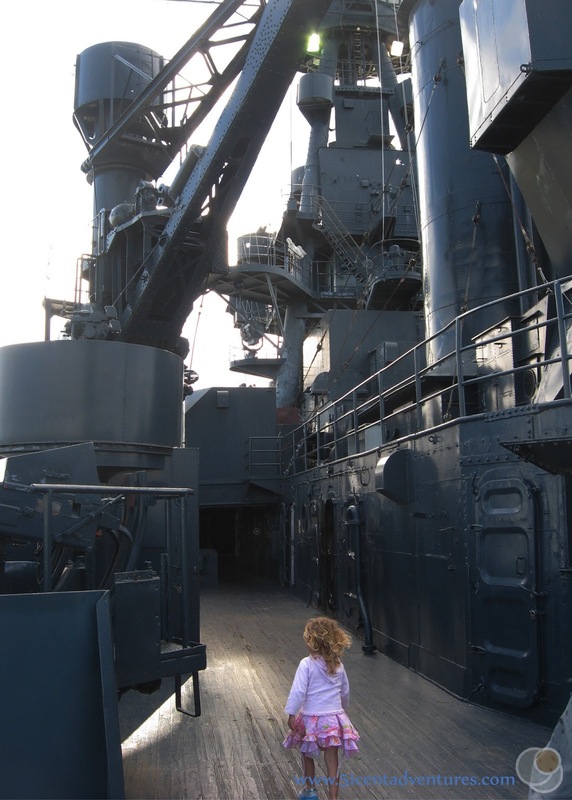 When I look back on this vacation I always think about how great it was to actually walk on a Dreadnought. Recommendation: Ships from the First and Second World Wars are incredibly rare. The fact that this ship is the only remaining one that served in both wars makes it a must see for any history buff. The USS Texas has been well preserved and will help you understand how important the United States Navy was in the history of the world. Directions: The Battleship Texas is located east of Houston and only a few miles south of the I-10. Places Nearby: The USS Texas is permanently docked next to the Houston Shipping Channel. There were barges sailing passed us the whole time we were there. 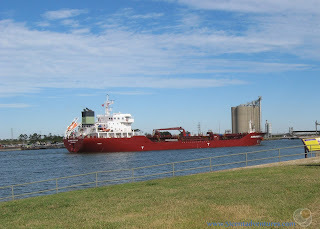 If you want to see more of the shipping channel you should take a tour of the Houston Port Authority. 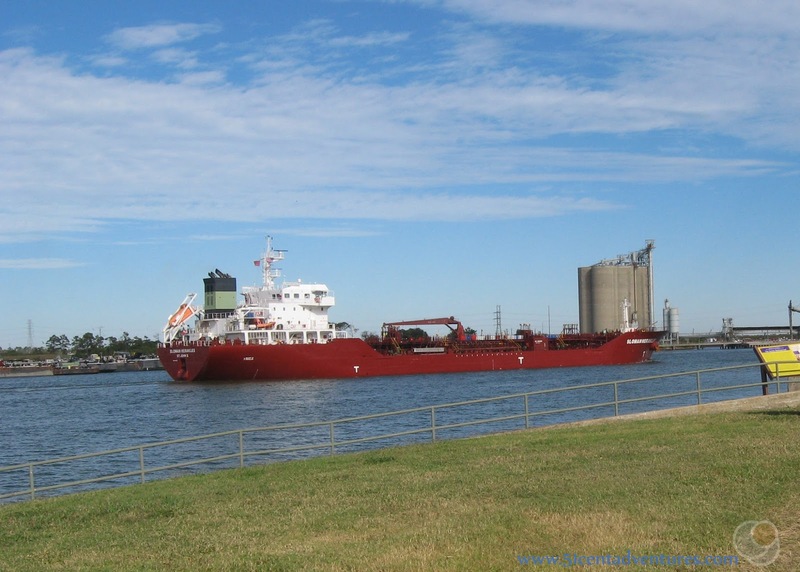 This hour long tour is free and will take you up and down the Houston Port. 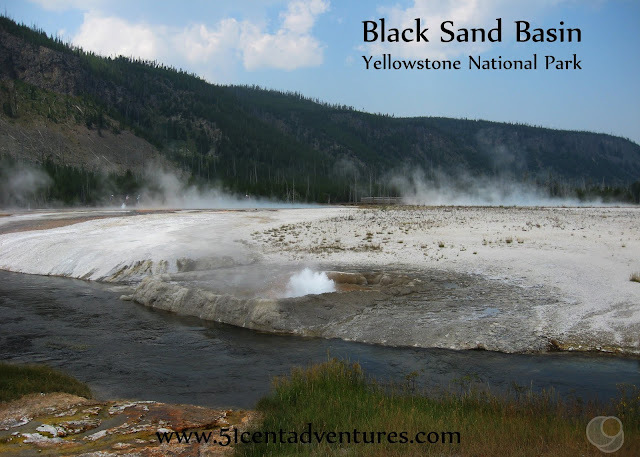 We didn't go on a tour on this road trip, because my husband and I had already taken the tour a year earlier.